Polymers are molecules whose structure is composed of multiple repeating units, the monomers. Protein and carbohydrate are an example of polymers. 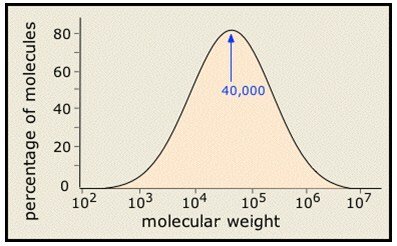 The molecular weight of a polymer depends on the number of repeated units. It is usually a range. The melting temperature also increase with the increasing molecular weight. The chemical structure of the polymer has also a fundamental impact in its physical characteristics. Polyamides are polymers where the repeating units are kept together by amide bonds. They are characterized by high strength, abrasion resistance, and resilience. 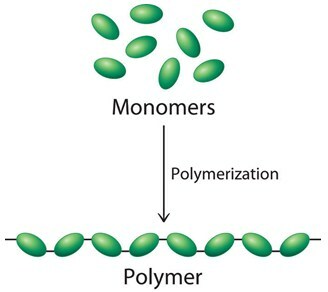 Polymers are molecules constructed from small molecular fragments called monomers. Monomers bind to each other to form a chain that is the polymer, usually of large molecular mass. The term "polymer" derives from the Greek and refers to a molecule whose structure is composed of multiple repeating units, the monomers. Thanks to their structure, they show unique physical properties like toughness, viscoelasticity, and a tendency to form glasses and semicrystalline structures rather than crystals. Protein and carbohydrate are an example of polymers. Wool, cotton, silk, wood and leather are natural ones. Plastics and natural materials such as rubber or cellulose are composed of very large molecules called polymers. Synthetic polymers usually contain only a few different monomers, whereas biological polymers can have many kinds of monomers, such as amino acids arranged in different orders. A very common example is the material that is used for plastic bags: polyethylene. It is transparent and flexible and it is one of the simplest polymer from the chemical structure point of view. It consists in random-length (but generally very long) chains, made up of two-carbon units. The molecular weight of a polymer depends on the number of repeated units. During the polymerization not all the chains grow homogeneously so that most of the synthetic polymers are really mixtures rather than pure substances in the ordinary chemical sense of the term. Their molecular weights are typically distributed over a wide range. Since C—C bonds can rotate free, long polymer molecules can curl up and and tangle. This effect and the polymer chain length influence many properties of the polymer. Polymers generally form amorphous solids since no regular arrangement is possible. There are, however, ways in which certain polymers can be partially oriented. It often happens that some parts can become sufficiently aligned to produce a region exhibiting crystal-like order, so it is not uncommon for some polymeric solids to consist of a random mixture of amorphous and crystalline regions. The melting temperature increases with the increasing molecular weight. At room temperature, short polymers (100 g/mol) are liquids. The ones of 1000 g/mol are similar to wax and resin. Solid polymers usually have longer chains, above 10 000 g/mol to several million of g/mol. The strength and flexibility of a polymer depends on different factors. One is the chain length in general, the longer the chains the stronger the polymer. The chemical structure of the polymer has also a fundamental impact in its physical characteristics. Linear polymers have only single chains. Their interaction is mostly due to Van der Waals and hydrogen interactions. 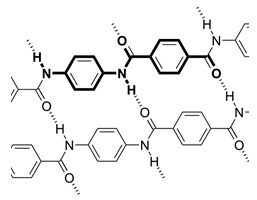 If side branch chains connect to other chains, the structure is no more linear and we name these polymer as branched. Straight, unbranched chains can pack together more closely than highly branched chains, giving polymers that have higher density, that are more crystalline and therefore stronger. They are also harder and more difficult to melt. In cross linked polymers, close chains ar joined to others in various positions via covalent bonding. These structure gives elasticity to the polymer. As an example we can think about rubber elastic materials. Small molecules that form 3 or more covalent bonds create a network polymer (epoxies and polyurethanes). Polymers are called thermoplastic if they soften when heated, and become rigid when cooling. They are easy to mold into a variety of shapes and lend themselves to recycling. Common uses for thermoplastic polymers include the fabrication of pipes, ropes, belts, insulators and adhesives. Usually these polymers have high molecular weight, that associate thank to weak forces, like polyethylene. Those characteristics make them peculiar in the manufacturing of clothing and carpets, accounting for 95% of the material used in women's hosiery. The most common polyamides are called nylons and they find application in engineering plastics, for example, in cars, and for food packaging because of their good balance between mechanical strength and barrier properties against oxygen, smells and oils. There are various types of nylon polymer, categorized depending on the nature of the chains. Nylon-6,6 is composed of two monomers each containing 6 carbon atoms: one is a 6 carboxylic acid with a -COOH group at each end and the other monomer is a 6 carbon chain with an amino group, -NH2, at each end. When these two compounds polymerise, the amine and acid groups combine, each time with the loss of a molecule of water. This process is known as condensation polymerization. Kevlar is a heat-resistant and strong synthetic fiber, typically used into ropes or fabric, or even bicycle tires and racing sails and bulletproof vests. The inter-molecular hydrogen bonds between the carbonyl groups and NH centers are responsible for its high strength. Additional strength is derived from aromatic stacking interactions between adjacent strands.